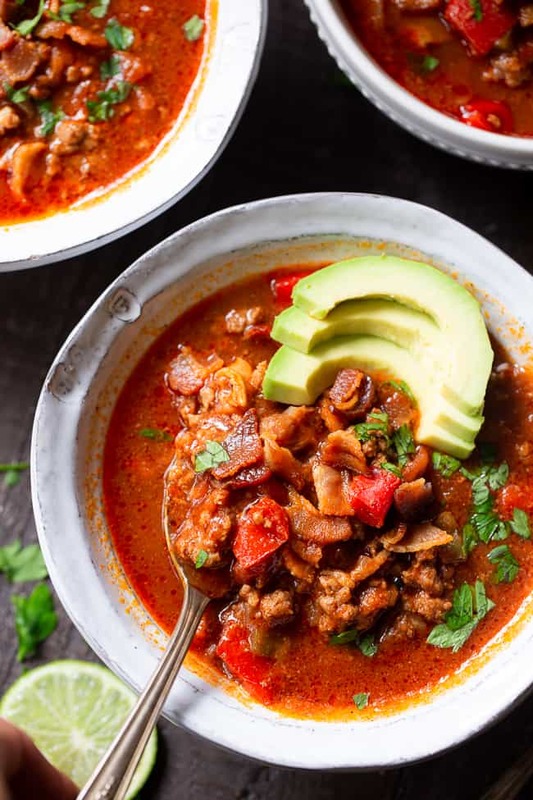 This easy instant pot beef chili is packed with everything you’re craving! Savory ground beef and bacon, peppers, onions and garlic and the perfect spices. It’s paleo, dairy-free, Whole30 compliant and keto friendly, delicious and family approved! Finally, after months of planning and prepping, our kitchen renovation is underway! Which means that beginning, um, TODAY, I have NO KITCHEN for a while. Something to get used to, especially for someone like me who spends 75% of her time in the kitchen, at least! How will I EAT? What will I do with my time?! What will I do with my ever-strong desire to cook and bake?! It’s a challenge for sure, but I’m actually pretty prepared. I have a rockstar toaster oven that can bake cookies or a meatloaf, and electric burners to cook my beloved breakfast hashes. And oh yes, I have my instant pot! I knew there was a point to this rant, and that was it – the Instant Pot. I’ve had my Instant Pot for about a year now and I don’t use it enough considering how awesome it is. Mainly because I’m a creature of comfort and my comfort is my stove/oven. All that’s about to change of course since I have no oven or stove now! And anyway, the times that I’ve used my Instant Pot to create recipes or simply to cook a quick meal for my family, I’ve been WAY impressed. It’s better than the slow cooker for me, for several reasons. I was just never much of a slow cooker person to begin with, honestly, because it seems like you typically have to use the stovetop anyway to sautee/brown your meat. The fact that you can do that step in the Instant Pot is a game changer for me! Oh, and the fact that it cooks everything super fast? It’s love, after all. In spite of what all this talk might seem like, this post isn’t just a big old Instant Pot commercial (not sponsored in any way, I’m just giddy over kitchen gadgets!). 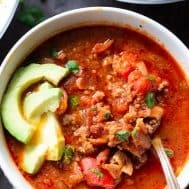 Nope, this post is actually about an incredibly easy and delicious Instant Pot Beef Chili Recipe! And, one that I will definitely cook a few times on my living room floor while the kitchen is out of commission. But, luckily the Instant Pot doesn’t discriminate – you can plug it in anywhere and cook your little heart out. Which I guess was the original point of why I’m loving it right now – it does it all – no kitchen needed. 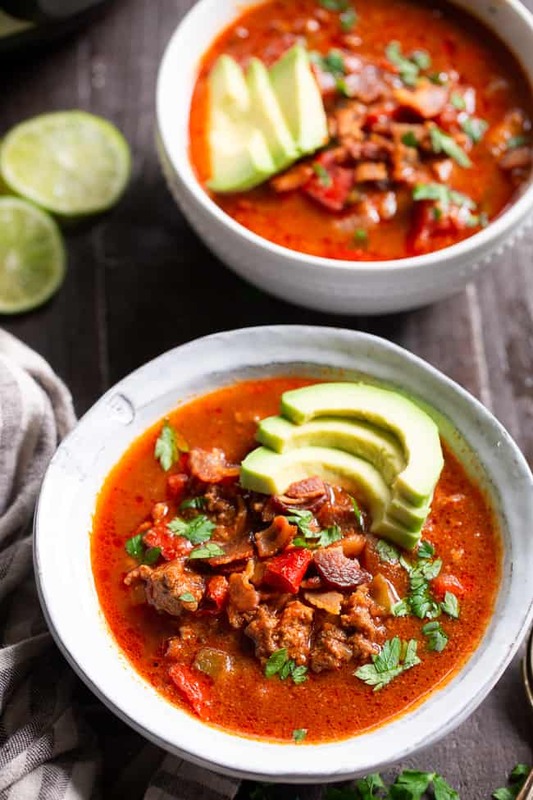 This recipe is super simple and for me, included “just the basics” – nothing fancy here, just flavorful, savory, hearty chili with the right amount of spice. Yes, I put bacon in it because bacon is a “basic” for me! I decided to sauté the bacon until in the Instant Pot before anything else, and leave it out until after the chili cooks. This is a personal preference because I like my bacon to keep some “crisp” in it. If you don’t mind a softer bacon and want the extra flavor, you can leave it in while you pressure cook the chili. To keep this lower in carbs, serve it as-is with some avocado, lime, and cilantro for garnish. For carb lovers, this beef chili is also delicious over a sweet potato or white potato. I hope you’re ready for healthy, hearty comfort food that also happens to be super easy. This chili is great served right away OR made ahead of time to reheat during the week. You can freeze it too – so perfect for meal prepping in advance. 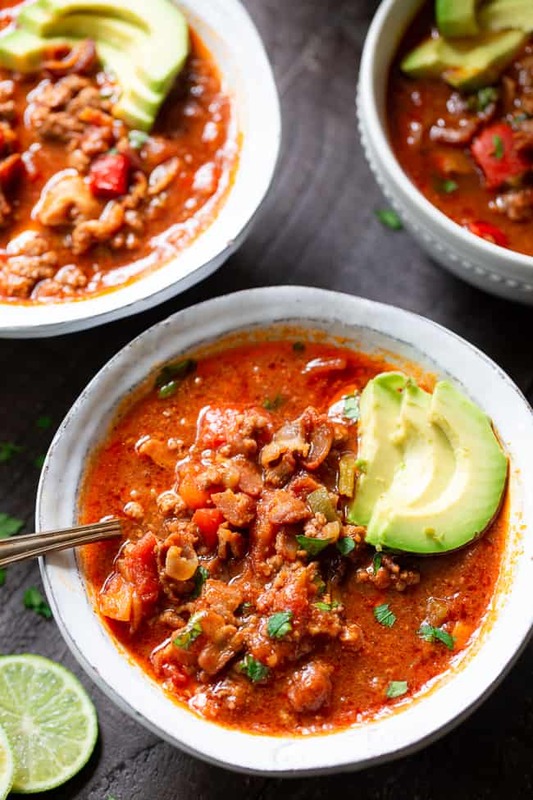 Grab your Instant Pot and get everything chopped – it’s time to make the best healthy beef chili! Have all ingredients chopped and ready to go before beginning. Press "sauté" on the instant pot and once hot, cook bacon until crisp, stirring. Remove with slotted spoon and set aside. Discard all but 1 tbsp bacon fat, then add beef and brown, stirring to break up lumps. Once beef is 75% done, add veggies and sauté until tender. Press “cancel” and add remaining ingredients, place the lid on top and turn vent to seal, then cook on high pressure 10 mins (pot will take several minutes to heat up). Once done, quick release the pressure, then add bacon back to chili, saving some for garnish. 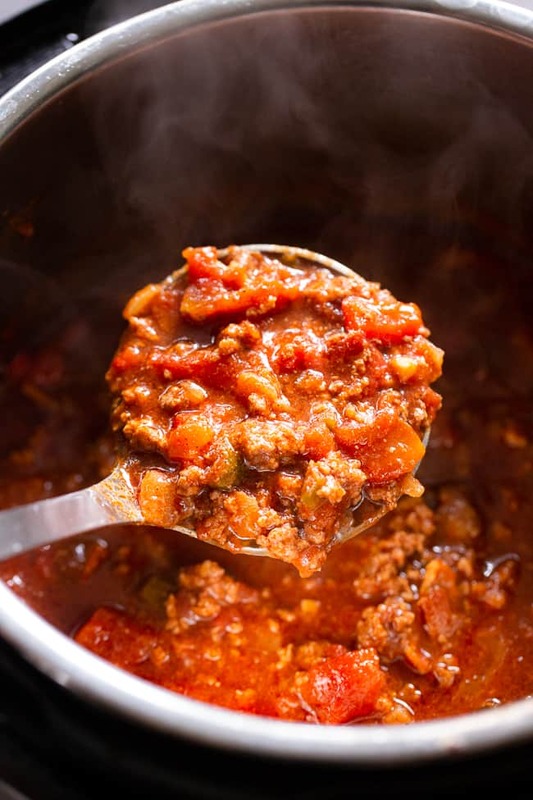 Allow the chili to cool a few minutes before serving. Garnish with cilantro or other herbs plus extra bacon and avocado slices, and serve as is, over a sweet potato or with homemade tostones! Enjoy! Want More Paleo and Instant Pot Recipes? Try one of These! Do you think this would be good with ground turkey and paleo turkey bacon? I think I need to invest in an Insta Pot! If we were to do this in the Slow Cooker, would you just put all ingredients in at same time, minus the bacon, stir to incorporate spices and then cook on low 5-6 hours? Wondering how to make in the crockpot too! Works great, I’ve done insta pot and slow cooker- both work well! Love this recipe! Making for the second time. 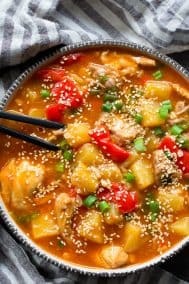 This recipe is easy and soooo flavorful. My new go-to chili recipe! Yum!!! Making again for the second time. I think this recipe will be one of the few that makes it onto a “recipe card”! 😉 Thanks for sharing! 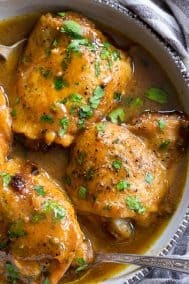 Hello friend, i am exited try to make this recipe. this meal is really healthy for us. you must to use this amazing portal for changing your system name, its really providing a easy instruction from this issue. 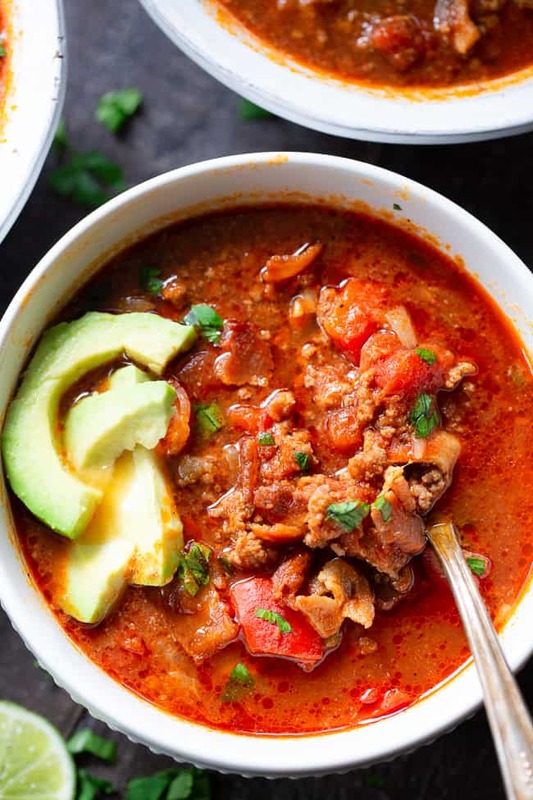 We love chili in our house so I can’t wait to try this recipe. 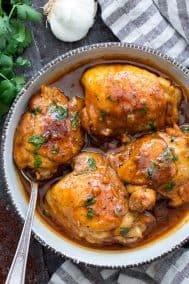 What could I use to thicken up the sauce a little? I recently tried an instant pot recipe for chili and it was too soupy. Thanks. I’m using venison rather than beef, which is really lean. Should I keep more than 1 tablespoon of the bacon fat? This was delicious and incredibly satisfying! Will definitely make again. Thanks for the recipe. Should the can of tomatoes be drained or undrained? Thanks!